Investigated since 2007, code name- 'Operation Plastic Pipe-line' ends with nearly Four Dozen Individuals Charged! Counterfeit Credit Cards Used To Steal Money and Buy Electronic Goods that Were Later Fenced; Stolen Credit Cards Allegedly Used Around the Globe Queens District Attorney Richard A. Brown, joined by Police Commissioner Raymond W. Kelly, today announced that an international forged credit card and identity theft ring based in the New York- metropolitan area and with roots in Nigeria has been successfully dismantled following the indictment this week of forty-five individuals. The ring – which was comprised of three separate identity theft and forged credit card groups that employed multiple cells – is alleged to have been responsible for stealing the credit cards and personal credit information of thousands of American and Canadian consumers, costing these individuals, as well as financial institutions and retail businesses, more than $12 million in losses over the past year alone. Commissioner Kelly said, “When these suspects said 'charge it' they stole more than cash and goods. District Attorney Brown said that the defendants have been charged in a series of indictments charging 784 pattern acts with, among other crimes, Enterprise Corruption under New York State's Organized Crime Control Act. They are accused of being members and associates of three organized criminal enterprises that operated in Queens County and elsewhere and that, between April 18, 2008, and April 23, 2009, systematically schemed to defraud thousands of unsuspecting consumers and financial institutions – such as Citibank, Bank of America, Chase and HSBC and a series of Canadian banks – including President's Choice Bank, CIBC, MBNA Canada and Bank of Montreal. • Account washers – responsible for obtaining as much pedigree information on an account holder as possible so that other account preparers could then use the information to access the victim accounts in order to take over the accounts. A supplier would then sell the accounts to identity theft cell leaders, who would either pay the supplier a flat fee for an account or a percentage of the funds accessed with the account. Prior to accessing the accounts, the cell leaders would turn the accounts over to a “mill” run by a document manufacturer who would create the forged credit cards and forged identification cards. A document manufacturer was paid for each dummy credit card and identification card he made. Once a cell leader had the fraudulent documents they were distributed to the ring's foot soldiers and shoppers who actually accessed the accounts. Foot soldiers would access the accounts using ATMs and bank tellers. While using an ATM was less risky, there was a limit as to the amount of money that could be withdrawn at any specific time (usually a few hundred dollars). Equipped with a forged credit card and a forged identification card (such as a driver's license), a foot soldier could withdraw up to $4,900 at a time at a bank. Shoppers were responsible for making purchases, usually high-end electronics with the stolen credit cards. The accounts the shoppers were given were those that had a high credit limit but no available cash advance. Shoppers were also responsible for finding “fences,” who would buy the electronics from them. The District Attorney said that the investigation – dubbed “Operation Plastic Pipe Line” – leading to this week's indictments and arrests began in September 2007 when police officers assigned to the Police Department's Identity Theft Squad commenced a joint investigation with the District Attorney's Economic Crimes Bureau into the large scale theft of Citibank credit cards and the subsequent use of the credit cards in Queens County and elsewhere. The investigation involved physical surveillance, intelligence gathering and court-authorized electronic eavesdropping on approximately one hundred different telephones and e- mail accounts in which thousands of conversations were intercepted – many of which required translation from Yoruba and Pidgin English to English. In the largest of the criminal enterprise indictments, it is alleged that Wole “Shola” Ogunwen was the leader of the Shola Enterprise and supplied the various accounts to his cell leaders – Ayanwale Ganiyu, Anthony O. Johnson, Kola Falidaya Molake, Adebayo A. Animashaun and Charles Femi Adoyele and his manager Jones Omoyemi Osinowo – who managed the local cells and managed the compromising of the supplied accounts. The accounts were allegedly prepared for usage by the defendants Idaya Molake, Hassan O. Anibaba, Abiodun A. Shotonwa, Anthony O. Johnson, Abimbola Lana and Samuel A. Adeoba. Steven Trevor Jackson was alleged to have been the forged document manufacturer who provided the “Shola” Enterprise with the forged identification and credit cards. John Doe (a.k.a. Abe), Ike Nwabuoke and Abidemi Olajide allegedly were the foot soldiers who went to the banks to make the withdrawals or to stores to make purchases with the compromised accounts. According to the charges, when purchases were made with these accounts, the items, usually expensive electronics, would then allegedly be fenced to Ronan Hassoun, who operates Five Brothers Audio and Video Electronics at 43 Graham Avenue in Brooklyn. Finally, it is alleged that any funds obtained from the compromised accounts would then be paid up to Wole Ogunwen. District Attorney Brown said that the twenty-six defendants charged in the Shola Enterprise Corruption indictment are also variously charged – along with ten others – in a second 309-count identity theft indictment. In addition, three of the purported cell leaders named in the Shola indictments – Charles Femi Adoyele, Ayanwale Ganiyu and Abdul Razack Yusuf – are charged in separate indictments with operating two smaller identity theft and forged credit card operation – the Femi Criminal Enterprise and the Ganiyu/Razack Criminal Enterprise. District Attorney Brown noted that, as part of the investigation, court-authorized search warrants were executed earlier this week at 17 locations and resulted in the recovery of forged credit cards, credit reports, machines used to stamp credit card account information onto cards and nearly $100,000 in cash. Twenty-two of the defendants have been arraigned thus far before Queens Supreme Court Justice Richard L. Buchter. The investigation was conducted by Detective Enrico Morriello of the New York City Police Department's Identity Theft Squad under the supervision of Sergeant Barry Neiss and Lieutenant Ruperto Aguilar and the command of Deputy Inspector Gregory T. Antonsen, of the Organized Theft and Identity Theft Task Force, and the overall supervision of Deputy Chief Jeremiah Quinlan, Commander of the Special Investigations Division, and Chief George F. Brown of the Detectives Bureau. Assistance was also provided by the NYPD's Asset Forfeiture Unit – namely, Detective Raymond Phillips, Sergeant Stephen Scalza and Lieutenant Charles Scalzo – and its Fugitive Warrant Squad. Out of state assistance was provided by the Chicago Police Department, the Georgia Bureau of Investigation, the Los Angeles County Sheriff Department, the Frederick (MD) Police Department and the Philadelphia Police Department. Assisting also in the investigation were various members of the District Attorney's Economic Crimes Bureau – namely, Assistant District Attorney Edward Suh, Paralegal Ericka Loperena, Investigative Auditor Phylesia A. Lang, Consumer Fraud Representative Michael Albanesi, Trial Prep Assistant Ivory Lai and Secretary Robin R. McCray. Assistant District Attorney Purvi Patel, of the Economic Crimes Bureau, is prosecuting the case under the supervision of Gregory C. Pavlides, Bureau Chief, and Christina Hanophy, Deputy Bureau Chief, and the overall supervision of Executive Assistant District Attorney for Investigations Peter A. Crusco and Deputy Executive Assistant District Attorney Linda M. Cantoni. District Attorney Brown expressed his appreciation to the United States Postal Inspection Service and the New York State Department of Motor Vehicles for their assistance and cooperation during the investigation. It should be noted that an indictment is merely an accusation and that a defendant is presumed innocent until proven guilty. The defendants are all charged with enterprise corruption and are variously charged with second-degree criminal possession of a forged instrument, third- and fourth-degree grand larceny, third-degree attempted grand larceny, fourth-degree criminal possession of stolen property, petit larceny, attempted petit larceny, and fifth-degree conspiracy. If convicted, they each face up to 25 years in prison. * denotes defendant is presently being sought. The defendants are variously charged with first-, second- and third-degree identity theft, first- and third-degree attempted identity theft, third-degree unlawful possession of personal identification, third- and fourth-degree grand larceny, second- degree criminal possession of a forged instrument, fourth-degree criminal possession of stolen property, fifth-degree conspiracy, petit larceny and attempted petit larceny. If convicted, they each face up to seven years in prison. * indicates that the defendant is presently being sought. The defendants are all charged with enterprise corruption and are variously charged with second-degree criminal possession of a forged instrument, third- and fourth-degree grand larceny, third- and fourth-degree attempted grand larceny, fourth-degree criminal possession of stolen property, petit larceny, attempted petit larceny, and fifth-degree conspiracy. If convicted, they each face up to 25 years in prison. * indicates that the defendant is presently being sought ** indicates that the defendant is also named in either the Shola Enterprise Corruption or/and Identity Theft Indictments. 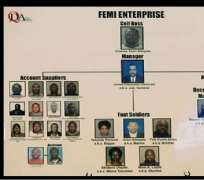 Eleven of the defendants are those named in the Femi Enterprise Corruption indictment above. Below is information on the additional 14 defendants. The defendants are variously charged with first- second- and third-degree identity theft, first- and third-degree attempted identity theft, second- and third-degree unlawful possession of personal identification, third- and fourth-degree grand larceny, third-degree attempted grand larceny, second-degree criminal possession of a forged instrument, fourth-degree criminal possession of stolen property, fifth-degree conspiracy, petit larceny and attempted petit larceny. If convicted, they each face up to seven years in prison. The defendants are all charged with enterprise corruption and are variously charged with second-degree criminal possession of a forged instrument, third- and fourth-degree grand larceny, fourth- and third-degree attempted grand larceny, fourth-degree criminal possession of stolen property, petit larceny, attempted petit larceny, and fifth-degree conspiracy. If convicted, they each face up to 25 years in prison. Seven of the individuals are those named in the Ganiyu/Razack Enterprise Corruption indictment above. Below is information on the additional 2 defendants, who are also named in the Shola Identity Theft Indictment. The defendants are variously charged with first- and second-degree identity theft, first- and third-degree attempted identity theft, third-degree unlawful possession of personal identification, third- and fourth-degree grand larceny, second-degree criminal possession of a forged instrument, fourth-degree criminal possession of stolen property, fifth-degree conspiracy and petit larceny. If convicted, they each face up to seven years in prison. New York City officials said Thursday they broke up an international credit card and identity theft ring that caused more than $12 million in losses last year. More than 35 people were indicted on enterprise corruption charges. So far, 22 suspects were arraigned in state Supreme Court in Queens. The ring was based in the New York area with roots in Nigeria, police and prosecutors said. Suspects were accused of shipping stolen or illegally obtained credit cards to buyers around the world. The investigation began in 2007 after a report of a large-scale theft of Citibank credit cards. As a NY criminal defense attorney and a former Manhattan prosecutor under Robert Morgenthau, I have defended or supervised numerous multi-million dollar investigations into Identity Theft, Credit Card Fraud, Forgery, Criminal Possession of a Forged Instrument, Grand Larceny, Falsifying Business Records and related fraud schemes. In fact, prior to starting Crotty Saland, LLP, I was assigned to the elite Identity Theft Unit when it was created by DA Morgenthau in the Manhattan District Attorney's Office. In that capacity I received extensive training and hands on experience in the “trenches” and “front line” of Identity Theft and related crimes. It comes as no surprise to me that another fraud scheme has reared its head and was ultimately broken up in Queens today. According to the Queens District Attorney's Office, Operation Plastic Pipe Line began in 2007 and resulted in the multiple hundred count indictment for Enterprise Corruption and the arrest of dozens of people. It is alleged that this ring, led by Wole “Shola” Ogunwen, used multiple “cells” to defraud banks and steal the personal identification of thousands of people. In the last year alone, it is alleged that the financial loss exceeded twelve million dollars. To perpetrate the crime, these cells would use counterfeit credit cards, set up fake accounts, withdraw funds from banks and purchase products to be shipped overseas. With strong ties to Nigeria, it is further claimed that this ring operated on a global level.